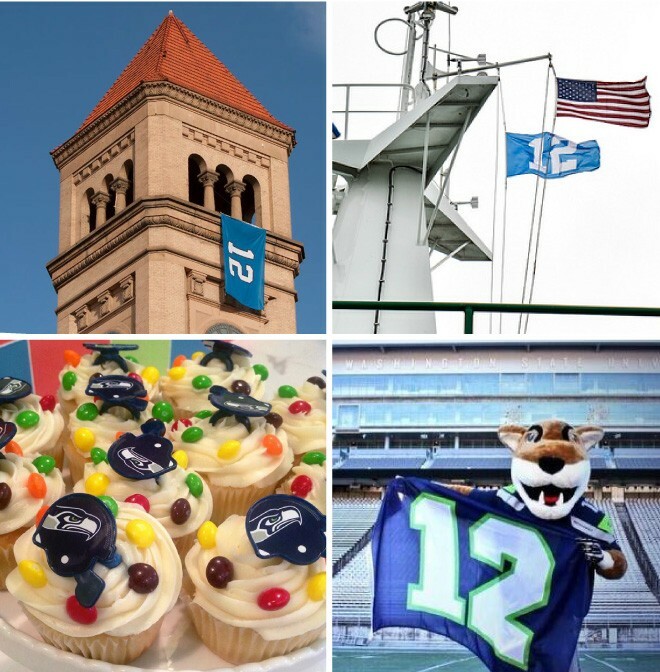 Clockwise from top left: 12th Man flag in Riverfront Park; 12th Man flag on Washington state ferries; WSU mascot Butch decked out in Seahawks gear; Seahawks cupcakes from Sweet Frostings. I personally grew up cheering for the Minnesota Vikings and haven’t cared about the NFL since Gary Anderson’s missed field goal in 1999. But this Seahawks game seems important — some people in our office won’t even say the S-word, for fear of a jinx — so I did a little research to find out why everyone’s so worked up about it. First, this is the NFC Championship. The winner goes on to the Super Bowl, and the loser goes home to cry until next season. None of this would matter if the Seahawks and 49ers weren’t both such good teams. The two are widely considered among the best in the NFL right now, if not the best, meaning there are plenty of unaffiliated football fans across the nation excited about this game. This will be their third matchup this season. The Seahawks won resoundingly, 29-3, in Seattle in September. But then the 49ers won, 19-17, in San Francisco in December. The head coaches have a history of hating each other’s guts that predates their NFL days. They became rivals when the Seahawks’ Pete Carroll was coaching a dynasty at USC and the 49ers’ Jim Harbaugh was coach at Stanford, exemplified by a notoriously unfriendly “What’s your deal?” exchange on the field back in 2009 after Stanford ran up the score in a 55-21 surprise drubbing. Now, the coaches say they don’t hate each other. It’s just about football, they say. Uh, yeah, exactly. Fans have gotten into the trash talk hijinks, too — Seahawks fans flew a “12th Man” flag over the 49ers’ stadium in December, and 49ers fans bought billboard space near Seattle to celebrate the team’s championship history. Clear Channel Outdoor, which owns the billboards nearest the stadium in Seattle, declared it a “protected zone” where only pro-Hawks messages are allowed. And the Seahawks blocked people with California addresses from buying tickets to the NFC championship game. But this is a matter of pride that goes beyond one season. If you've noticed nothing else about the season so far, hopefully you've seen the number "12" appearing all over the state. Seahawks fans pride themselves on being the best, which is how they got the “12th Man” moniker. They earned a world record for loudest crowd at the game on Dec. 2. Spokane’s clocktower in Riverfront Park even got to display the 12th Man banner. The biggest reason this matters so much to fans may have nothing to do with San Francisco at all. The Seahawks’ most recent (and only) Super Bowl appearance was in 2006, when they lost to the Pittsburgh Steelers 21-10 after a string of bad calls. The Seahawks were robbed. Even the head referee admitted it years later. The Seahawks didn’t do so well in the following seasons, so fans are still hungry for a chance at redemption. That’s surely not every reason this game matters, but you can find out more from nearest person dressed in blue and green. We’ve seen a lot of places around Spokane doing $12 specials and other deals for Seahawks fans. The Garland Theater is showing the game if you’re still looking for a free, family-friendly place to watch.